The Olympus mju: 770SW is waterproof, shockproof, freezeproof, and crushproof. But what about idiot proof? Having hundreds of photos to look back on once you're back from holiday is a great way to unwind, as well as showing others what you got up to when away. Whether you're a novice photographer or more of an enthusiast, there's a suitable holiday camera for you on the market. Here we pick a few of our favourites, to go with yesterday's selection of the best digital music players to bring on holiday . With a strong high-tech features spec, the 8-megapixel Canon Ixus 950 IS delivers photos with excellent image quality and is very durable with its solid metal case. It features a 4x lens, as well as face recognition and image stabilisation. It's fast and has a great 2.5-inch screen, and an easy-to-use Apple iPod-style clickwheel for selecting photo modes at the back. Priced at £330, it's not the cheapest compact camera model around but is an excellent all-round choice for photography beginners. The EX-V7 is currently the world's slimmest camera to feature a 7x zoom focal range, and is activated by opening the lens cover, just like a mobile phone camera. Priced at £299, the Casio Exilim EX-V7 is very compact at just 20.8mm thick, extremely speedy to operate and offers an excellent zoom range. It is well-built and comes with a 2.5-inch LCD screen and a rechargeable lithium-ion battery. This low-light camera is perfect for indoor or night shots, and is also good for taking photos of moving objects, such as kids playing on the beach. The Fujifilm FinePix F31fd is a good quality compact snapper that features face recognition technology, a 6.3-megapixel CCD sensor and a 3x optical zoom lens. At £250, it is excellent value for money. The 7.1-megapixel Nikon Coolpix S500 is the most compact digital camera in the world, according to Nikon. At 88 x 51 x 22mm, it has 3x optical zoom and can take photos just 0.6 seconds after being switched on. It has a 2.5-inch LCD screen and a maximum ISO setting of 2000. It costs £250 and is a great pick for the holidays. The Olympus mju: 770SW is the first compact digital camera to be completely waterproof to 10m, shockproof to 1.5m, freezeproof to -10C and crushproof to 100kg. Which means that you can take it pretty much everywhere you go, and more importantly, still have it working at the end of the holiday. 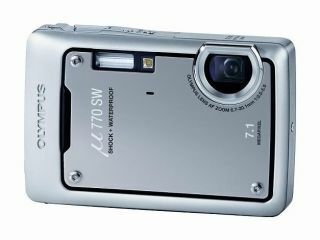 Priced at £300, it features a 7.1-megapixel CCD sensor, 3x optical zoom and 25 scene modes, of which four are for underwater shots. The Sony CyberShot T100 crams in an 8.1-megapixel sensor, a Carl Zeiss lens, 5x optical zoom and a 3-inch LCD screen into its slimline 22mm body. It comes with full high definition 1080-line output for displaying photos on a high definition TV, features face recognition technology and uses the same image processor that the Sony Alpha digital SLR cameras use. Available in red, black or silver, the T100 is priced at £330. If you're really into your photography you might want to consider a digital SLR camera instead of a more compact version. Check our Top 10 Digital SLRs feature for advice on the best digital SLR cameras money can buy.